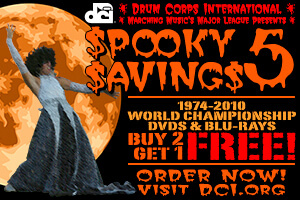 Drum Corps International's fifth annual Spooky Savings sale is here, bringing you six-foot deep discounts on prior-year World Championship DVDs! This season's sale lets you buy any two DVD or Blu-ray sets and get one free. Mix and match any year in our Legacy and World Championship collections spanning from 1974 to 2010. These deals are frightfully good, but will only be available until All Hallows Eve, Monday, Oct. 31. Order today ... if you dare! Call 317.275.1212 or shop online at store.DCI.org. Sale begins 9 a.m. ET Monday, Oct. 17, 2011 and ends 11:59 a.m. ET Monday, Oct. 31, 2011. Offers cannot be combined with other promotions or discounts. Offers not valid on prior purchases. Order confirmations DO NOT reflect discount pricing, but will be applied upon order processing. Drum Corps International reserves the right to modify or cancel promotion at any time.